Over the last few years, our tennis program has grown. Many of our members have recently discovered the joys of tennis later in life and others have been playing for decades. 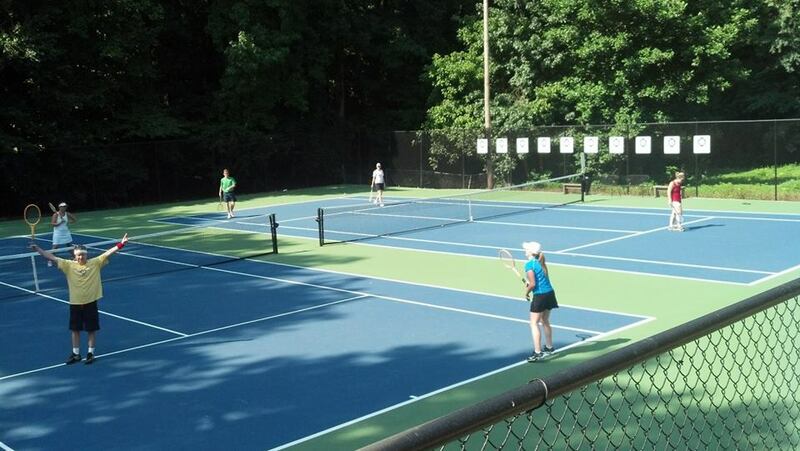 We always have several different teams playing out of our courts, from beginner to advanced. We also offer tennis summer camps for kids and currently have a Junior Mixed Alta team. 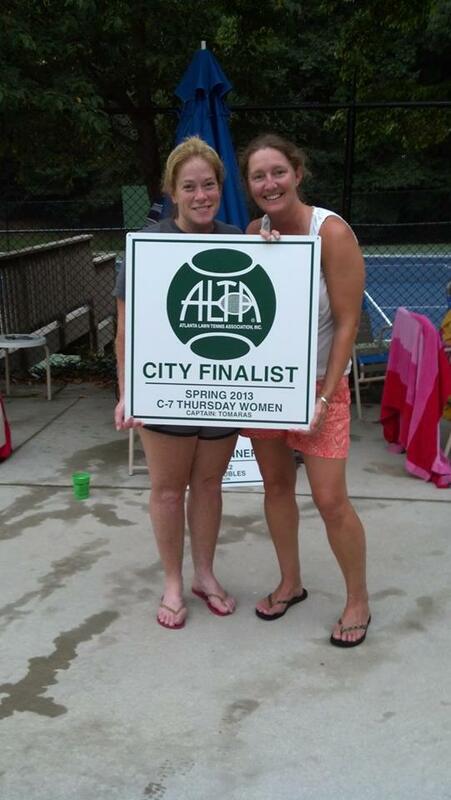 Everyone is welcome on our courts, all ages, all abilities. In the last few years, we have invested in our tennis program. We resurfaced the courts, built a tennis deck, added new tennis nets, painted the fence, replaced all the lights, and bought signs for all of our winning ALTA teams. 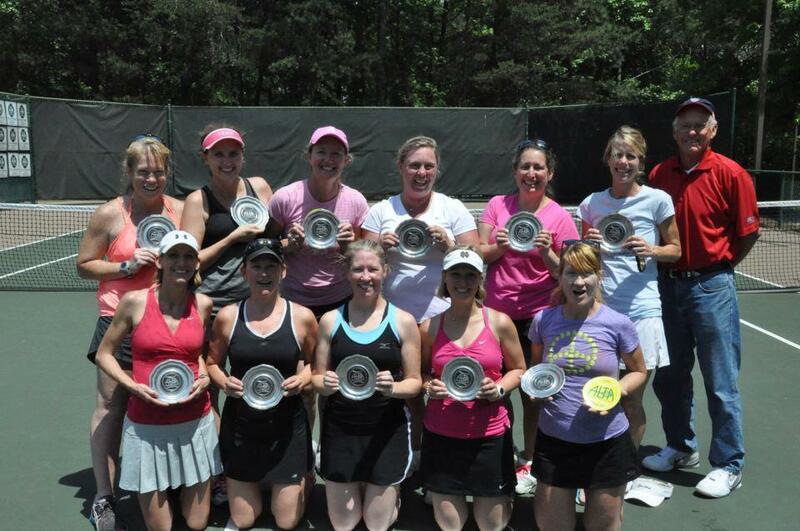 We are proud of our courts and of the tennis programs we offer our members. If tennis is not your thing, we would still love to have you come and hang out on our tennis deck and cheer on the players. Courts are available for member use every day from 8:00 AM - 10:00 PM, with the exception of the times that are designated for ALTA/USTA practices or matches. Registered team are allowed one pre-reserved 2-hour practice/week, plus matches. Practices on weeknights will be from 8-10 pm, giving all non-team members time to play after work. To reserve a court for play, please sign up on online. Email us for the login info and/or the court combination lock. If you reserve a court and then are unable to use it - you must cancel your reservation, even if it is at the last minute. Members check the reservations online often for last minute playing; please be respectful of everyone's time. Failure to cancel if you don't show up can result in losing access to online reservations. For information on joining a tennis team, contact us. Not ready for a team? Click here to find someone for casual play. 1. Please wear only regulation tennis shoes and appropriate attire. Wooden Wackets only during our Wooden Wacket Wound Wobbin Tournament. 2. NO unsupervised children, games or wheeled vehicles (skates, bikes, scooters, etc) are permitted on the tennis courts. And NO PETS allowed. 3. Please place trash in containers and do not take glass inside the courts. Tennis teams are responsible for cleaning up the area and taking the trash to the bin when they are done. 4. Members may sign up for courts using our online system. Courts may be reserved no more than 1 week in advance. 5. ALTA and USTA teams have priority during scheduled matches and practices. Team schedules and practice nights need to be posted online. 6. Tennis guests must play on the same court as a member. Click to read our guest policy. 7. The Club is not responsible for lost articles or for injuries on the courts. 8. You MUST lock the gates and turn out the lights when you leave the courts.